and featuring Natalie Green,* Anjanette Hall,* Wendy Kriss, Jason Markouc, Chris Richards* and Jon White. SUNDAY, JULY 10, at 2 p.m.
Set four years after 9/11, Jericho introduces two strangers still paralyzed by the tragedy. One lost a young husband; the other escaped a burning tower. They meet at a Thanksgiving dinner, where the holiday is dampened by their sorrow and guilt. Jericho mixes biting humor with the many other ways we cope with loss and regret. The play was honored with the 2011 Edgarton Foundation Play Award and by the National New Play Network. 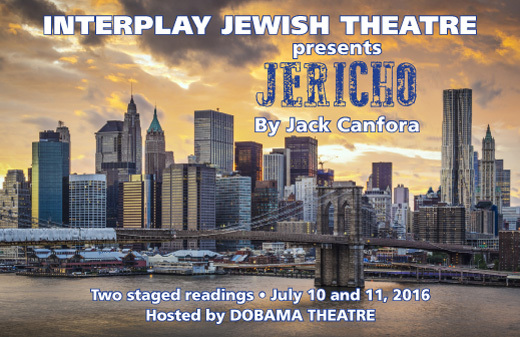 New York-based JACK CANFORA is a playwright, actor, musician, and teacher of high school English. His other produced works include: Place Setting and Poetic License; and his web series The Small Thing was awarded a 2016 Webby Award for Best Writing.